How complete is your cat’s parasite protection? 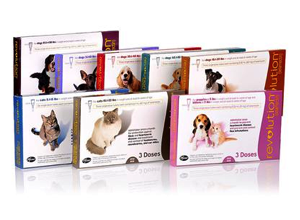 There are many parasite medications available that treat common external parasites such as fleas. However, there are a host of internal parasites that can’t be seen, which can also be dangerous to your cat’s health. REVOLUTION is a medication that treats and prevents a broad range of external and internal parasites and can provide the protection that your cat needs. The Companion Animal Parasite Council (CAPC), an independent group of veterinary experts and practitioners, recommends year-round, broad-spectrum parasite control for cats. Do your cats stay indoors? Even indoor cats are at risk for parasite infection. In fact, all the parasites in this brochure have been found in both indoor and outdoor cats. What are they? Fleas are the most common external parasite found on cats. They feed on a cat’s blood, and lay eggs that fall off anywhere the cat goes inside the home, such as the carpet. These eggs hatch and develop into adult fleas that can then re infest pets in the home. Why should I protect my cat from fleas? How is my cat at risk? Fleas can be brought in by other animals or people. Once inside they can multiply quickly, with female fleas able to lay up to 40-50 eggs per day. These eggs represent adult fleas that can infest your cat and other pets. Heartworms are potentially lethal parasites transmitted by common mosquitoes. After infecting a cat, they eventually develop into adult heartworms in the large blood vessels of the lungs, near the heart. Why should I protect my cat from heartworms? Heartworms can be carried inside by mosquitoes. In a clinical study, >25% of cats diagnosed with heartworm disease were confirmed by their owners to be indoor-only cats. Ear mites are tiny parasites that live mostly in a cat’s ears and feed off the ear lining, producing a black substance that looks like coffee grounds. In heavy infestations, ear mites can spread to other parts of a cat’s body. Why should I protect my cat from ear mites? Can cause severe irritation, resulting in cat’s ears becoming red and inflamed. Ear mites are highly contagious. They can find their way indoors with other pets that are infested (dogs, cats, and ferrets), and can then quickly pass on to your cat. Roundworms, are the most common internal parasite found in cats. They live in the small intestine, and both adults and eggs are passed in a cat’s feces or vomit. Why should I protect my cat from roundworms? They not only affect your cat’s health, they are also dangerous to people, especially small children. Can be passed to people who come into contact with contaminated soil or feces. Due to the risk of infection in people, the CDC recommends that precautions be taken, including providing pets with regular treatment for intestinal parasites. Do not allow children to play in areas that have been soiled with animal stool, and cover sandboxes when not in use. Simple monthly treatments keep your cat protected all year long with Revolution!